Identified returnees who were living outside with the friend and relatives were organized and mobilized to prepare themselves for resettlement. The major setback was to find the land for them. The case was referred to the Government Agent and the Divisional secretary, to find the space for relocations. This successful attempt to get land grant has helped the community to resettle with the support of NHDA and DS build houses and toilets to the resettles. The women headed households were the prioritized groups to get land and shelters in new settlement area. Community participation was a key in this project. reestablish the land rights and the new settlement for the landless families. The women emphasized that RAHAMA should look into the income development part to improve the economic side of the women. During the internal conflict in the country the population of Musurampiddy was faced with multiple displacement and at the end of the conflict the populations were resettled by the Government and RAHAMA, There are about 25 families who need safe accommodation and sanitation facilities where they were recently resettled after the land was released by the Government. 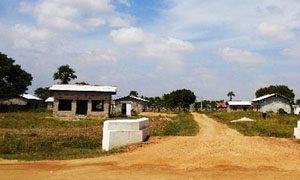 The main focus of this project is to protect women and girl children in the resettled area of Musuranpitty. Kanthimathy Sahathevan is a landless woman originally from Mannar district, now living in a resettled village Musurampiddy, in Kilinochchi. Following many years of internal displacement, her family continued to live in IDP camps and makeshift shelters. The programs from the other organizations were not reaching them due to non-availability of land for them to settle. What is the solution then? The initiatives by RAHAMA, together with the government to ensure availability of land has been the key to building houses for them. 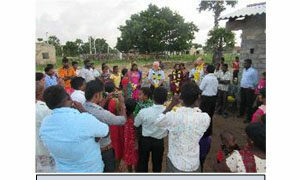 25 families similar to Kanthimathy’s have joined hands to work with RAHAMA to solve the land and the housing issues. As a result of this joint work now each one of them has secure dwellings by owning the land plots where the houses and the toilets with wells are constructed. The picture shows the initial dwelling, which is a temporary hut constructed by themselves. The shelter was constructed with tin sheets and cadjan and was about 160 square feet. The safety and security for the women and children is not there in huts of this nature. If we are to support the war affected women we need to help them to raise their quality of life with basic needs such as accommodation, water supply and sanitation. RAHAMA’s main focus for the resettlement starts here and then we improve the income generation concept to make them capable of managing the families. We worked with the government and the communities to identify the most vulnerable families for resettlement. 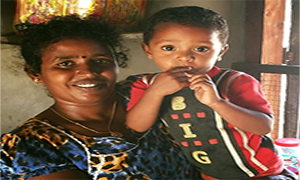 Kanthimathy’s family was among those selected for housing assistance from the village. 25 families have completed Semi-permanent houses with two rooms and one hall (400 Sq. / Ft) which were planned with the collaboration of the housing authority of the government. RAHAMA has supported with an amount of LKR 245,000.00 including labor and materials, the government has supported with 100,000.00 loan for Labor and materials and beneficiaries contribution of 50,000.00 for labour and materials. Both Sakathevan (husband) and Kanthimathy are proud of their active engagement in the construction of the house. “This house is a wonderful gift we received from the RAHAMA – FORUT Project. We never imagined that we would be able to build a home like this in our lifetime” Sakathevan stated. Sakathevan and Kanthimathy run their Grocery business as their main livelihood activity.